Why See Beast Coast - Joey Badass with Flatbush Zombies? 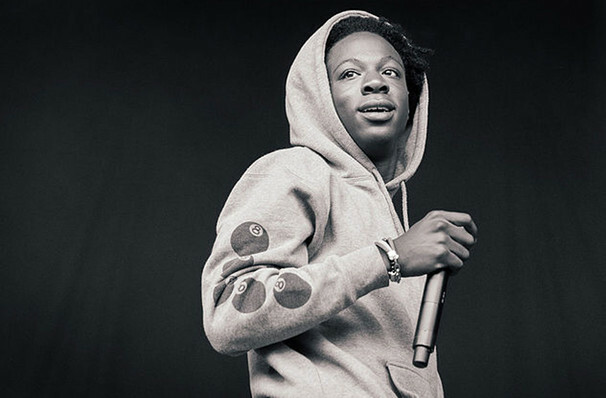 In 2013, Joey Badass (rapper, MC and leader of Brooklyn-based hip hop collective Pro Era) hit the road with his crew, fellow East Coast rap revivalists Flatbush Zombies and psychedelic hip hop duo the Underachievers on the Beast Coastal Tour. Now, six years later, they've shared their first ever collaborative track as the supergroup Beast Coast and are hitting the road once more on a coast to coast Summer Tour. Unveiled in March 2019, 'Left Hand' is a bristling, high energy posse cut featuring the talents of Mr Badass himself, Meechy Darko, Erick Arc Elliott, Nyck Caution, Issa Gold. CJ Fly, Zombie Juice, AK and Kirk Knight. Primal, heavy-hitting drums fuse with a dark, ominous synth line before giving way to an epic, anthemic chorus that is sure to whip their oncoming audiences into a frenzy. A sign of things to come, 'Left Hand' points towards a debut album, which is rumoured to hit the radio waves before the band head out on tour. Seen Beast Coast - Joey Badass with Flatbush Zombies? Loved it? Hated it? Sound good to you? 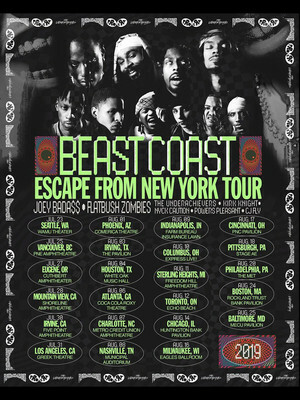 Share this page on social media and let your friends know about Beast Coast - Joey Badass with Flatbush Zombies at Stage AE. Please note: The term Stage AE and/or Beast Coast - Joey Badass with Flatbush Zombies as well as all associated graphics, logos, and/or other trademarks, tradenames or copyrights are the property of the Stage AE and/or Beast Coast - Joey Badass with Flatbush Zombies and are used herein for factual descriptive purposes only. We are in no way associated with or authorized by the Stage AE and/or Beast Coast - Joey Badass with Flatbush Zombies and neither that entity nor any of its affiliates have licensed or endorsed us to sell tickets, goods and or services in conjunction with their events.